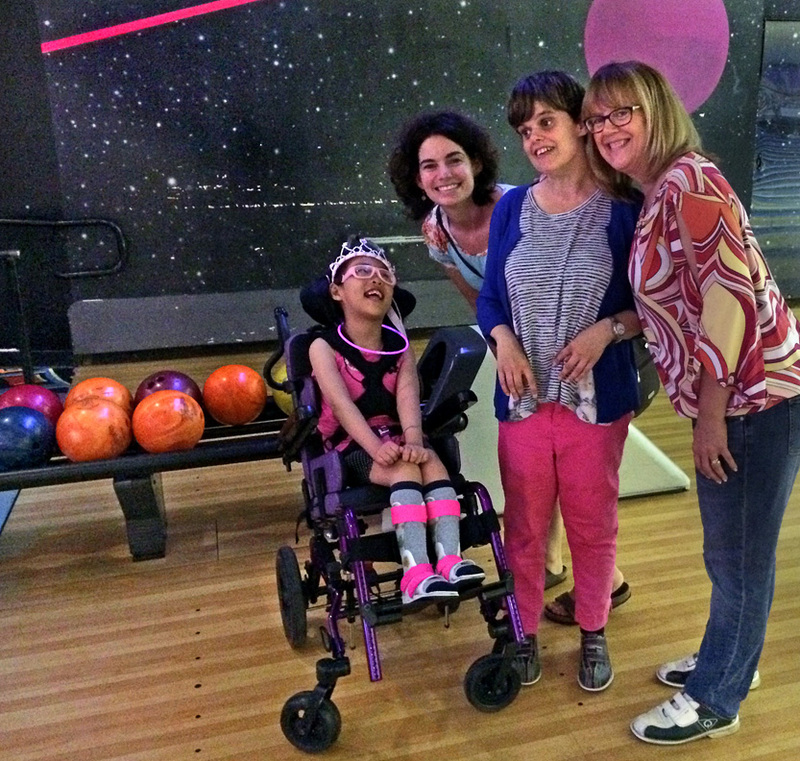 (From left) Annie and Nikki Cardoza celebrate Annie’s 8th birthday at Country Club Lanes in Sacramento with friends Kristie McCleary and Julia Moore. Look at you, celebrating your first American birthday, you and a gaggle of friends and relatives at a local bowling alley. (Can it get more American than that?) 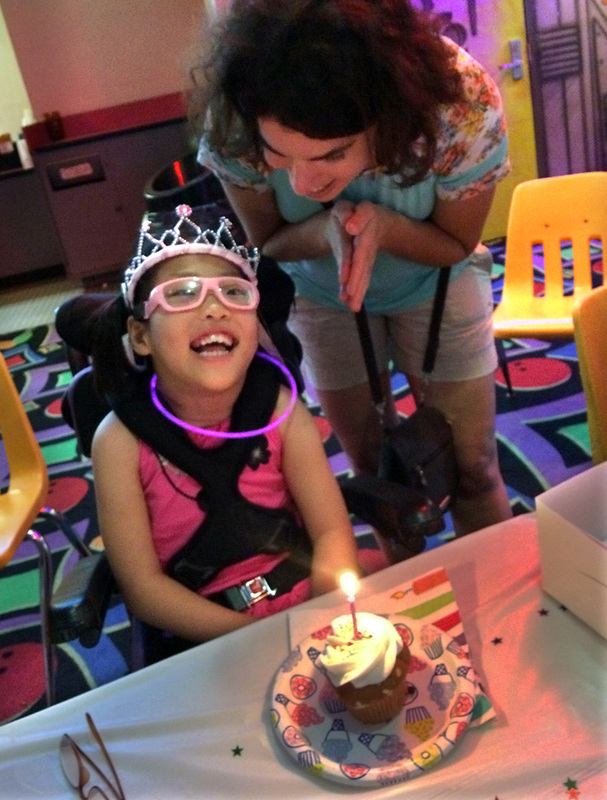 Because you, just turned 8 years old, have developed a love for bowling, of all things. You sit up tall in your purple wheelchair behind a tall frame with a bowling ball on it. You push, and varoooom! The ball careens down the sloped frame onto the lane and toward its target—those 10 pins arranged in a neat triangle. Blam! The ball hits, pins fall, you laugh. After you and your friends are finished knocking down the ten pins, your mama distributes cupcakes (“vanilla or chocolate?” she asks each guest) atop long tables festooned with birthday paper plates and napkins. Everyone sings you a rousing “Happy Birthday.” You know this song; you grin and chuckle as you are serenaded by people who did not know you a year ago. But they are family and friends now; you are beloved in your new land. I hardly recognize you as the thin little girl with the mohawk named Long Xin Zi (Joyful Purple Dragon) your mama and I traveled to retrieve last summer in Changsha, Hunan, China. You were so skinny and so hungry, and we could not get enough food in you. That’s changed—you’re filling out nicely (you have actual cheeks and thighs! ), and you’ve grown much taller. Your long hair is today caught up in two ponytails, one on each side of your head. You have new pink goggle-style glasses that have brought your new world into focus. Your new ride is a racy purple wheelchair that fits you much better than your old one. You’re in school where you practice standing and speaking. You ace your spelling tests with sight words and image cards—you can identify the spelling of “mountain.” Mountain! Your sensational smile has not changed—it beams almost constantly. At your mama, your grandma and grandpa, who are at the bowling alley today, at all these people here who wish you well. Your mama reads you your cards and opens your gifts, holds each one up so you can see it. Your smile grows even bigger and your arms tense with excitement. Birthdays are so much fun! No one knows exactly when you were born—just that you were found under an overpass on May 22, 2010, in Changsha, and you were estimated to be a year old. So it was that your life began again then, with new people at Butterfly House hospice caring for you, the people who saved your life and with whom you spent three years before moving to an orphanage across the city. That’s where you spent another three years in the care of more good people before your new mama traveled thousands of miles to get you, and another chapter of your miraculous life began in a new country. 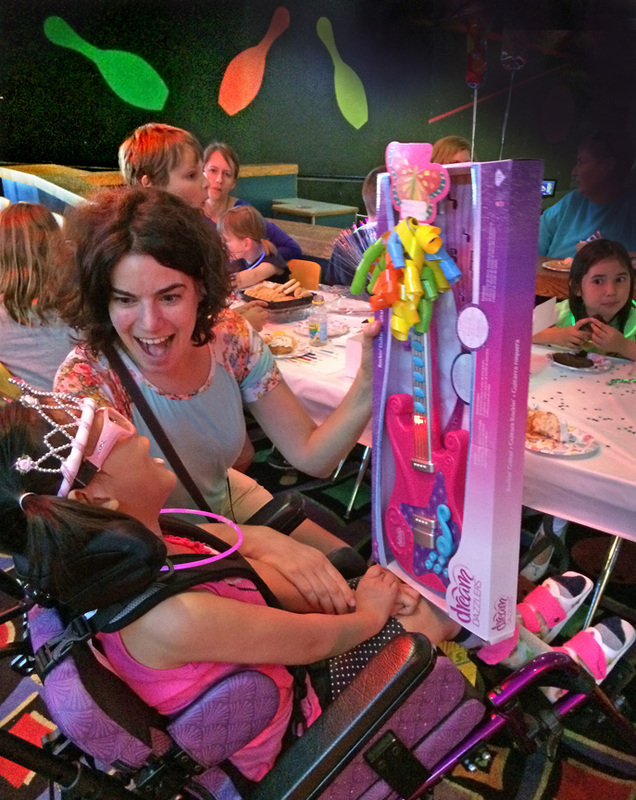 People who hear your story are stunned by the determination and fortitude you’ve apparently had from the beginning, the fact that cerebral palsy has not stopped you from becoming a smart girl, wholly engaged with the world. I am honored to be one of your aunties who loves reading and singing to you, thrilled to be close to you and your equally remarkable mama. Happy Eighth Birthday to Annie, indeed! What a difference a year makes! Yes, her beautiful smile is still there, but she has filled out, not as frail looking. Her legs and arms are relaxed. That is a great purple carriage to hold her head more straight and the pink glasses are very cool! How wonderful that she can bowl and NOW will be adding guitar to her many accomplishments! Thank you so much, Jan for keeping us updated. You are a very good Auntie! Thanks, Jan, for posting. Great to hear that Annie’s doing so well. Happy Birthday, Annie🎂 from Skip & Jo Shuman. Annie looks so happy and excited. It’s so gratifying to see how much she’s grown and how pretty she looks with her crown and pink goggles. I’m so happy for her and her mama. They look like they were made for each other. And to think, Jan, you helped to make Annie’s new life possible. What great auntie you are! 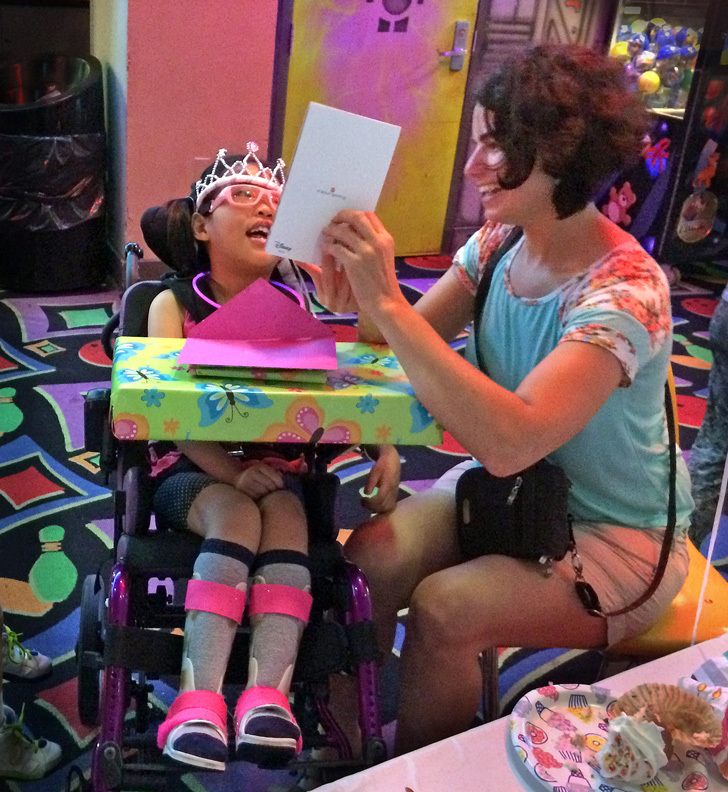 Thanks for the wonderful story about Annie’s 8th B-day, Jan. What a sweetie. Love the pic of Nikki holding up the guitar gift. Heartwarming!